This chapter examines the changing nature of literacy by analysing different kinds of multimodal literary texts—graphic novels, digital storytelling, transmedia storytelling—and showing how they are developing new narratives which are nonlinear, participatory, and gamelike. The writers argue that these types of text are more accessible to lower level language learners because the meaning of the text is delivered through visuals and sound as well as the written word. 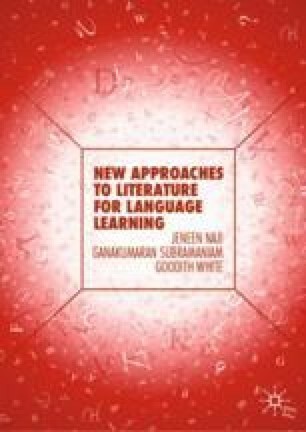 They argue that literacy now involves the ability to interpret layers of meaning generated by the combination of media types involved in multimedia texts, and the ability to understand how visuals and sound are involved in meaning-making is as important as interpreting the written word. These are also forms of ‘language’ which language learners need to cope with. Breuer, E., and Archer, A. (2016). Introduction: A Multimodal Response to Changing Communication Landscapes in Higher Education. In E. Breuer & A. Archer (Eds. ), Multimodality in Higher Education. Leiden: Brill. Available at http://ebookcentral.proquest.com/lib/nuim/detail.action?docID=4547314. Accessed February 10, 2018. Chandler, D., & Munday, R. (2016). A Dictionary of Media and Communication (2nd ed.). Oxford: Oxford University Press. Available at http://www.oxfordreference.com/view/10.1093/acref/9780191800986.001.0001/acref-9780191800986-e-1806. Accessed February 10, 2018. Fleming, L. (2013). Expanding Learning Opportunities with Transmedia Practices: Inanimate Alice as an Exemplar. Journal of Media Literacy Education, 5(2). Available at http://digitalcommons.uri.edu/jmle/vol5/iss2/3. Accessed April 12, 2016. Goldstein, B. (2016). Visual Literacy in English Language Teaching: Part of the Cambridge Papers in ELT Series. Cambridge: Cambridge University Press. Available at cambridge.org/betterlearning. Jenkins, H. (2007). Transmedia Storytelling 101. Available at http://henryjenkins.org/2007/03/transmedia_storytelling_101.html. Accessed April 16, 2016. Mozilla. (n.d.). Web Literacy 2.0. Available at http://mozilla.github.io/content/web-lit-whitepaper/#introduction. Accessed April 18, 2016. The BradField Company. (2005–2016). Inanimate Alice. Available at http://www.inanimatealice.com. Accessed April 18, 2016. The BradField Company. (2015). A Transmedia Experience for All Students. Available at http://www.inanimatealice.com/resources/doolin_case_study.pdf. Accessed April 16, 2016. The BradField Company. Inanimate Alice [Facebook]. Available at https://www.facebook.com/InanimateAlice. Accessed April 16, 2016. Thomas, S., Joseph, C., Laccetti, J., Mason, B., Mills S., Perril, S. et al. (2007, December 3). Transliteracy: Crossing Divides. First Monday, 12(12). Available at http://firstmonday.org/article/view/2060/1908#t2. Accessed April 18, 2016. Wilson, C. (n.d.). What Is Digital Storytelling and How to Get Started. Athabasca University E-LAB. Retrieved March 28, 2018, from http://elab.athabascau.ca/workshop/digital-storytelling.